Book DescriptionGarry Kasparov and Anatoly Karpov are unquestionably the participants who featured in the greatest ever chess rivalry. Between 1984 and 1990 they contested five long matches for the World Championship. This 3rd volume of the 'Garry Kasparov on Modern Chess' series concentrates on the third and fourth matches in this sequence: London/Leningrad 1986 and Seville 1987. Both matches were tremendously exciting and hard fought and both produced chess of an extremely high level. The 1986 clash was groundbreaking in that it was the first World Championship match between two Soviets to take place outside Moscow. It was split between London and Leningrad with twelve games being played at both venues. The defending champion was now Kasparov (having won the 1985 match) and he leapt into an apparently decisive three point lead. However, this sensationally dissolved when a crisis broke out in the Kasparov camp. Karpov exploited this and pulled off the remarkable feat of winning three games in a row. Kasparov finally regained his composure and eventually clinched the match with a late victory. The 1987 match was notable for it's sensational finale. Kasparov approached the final game with a one point deficit, knowing that only a win would enable him to retain the title. When the game was adjourned overnight in a position where Kasparov had to win to stay champion, Spanish TV cleared its entire schedule so that the nail-biting conclusion could be watched live. A pre-internet global audience of millions was glued to their TV screens as Kasparov ground out his historic victory. 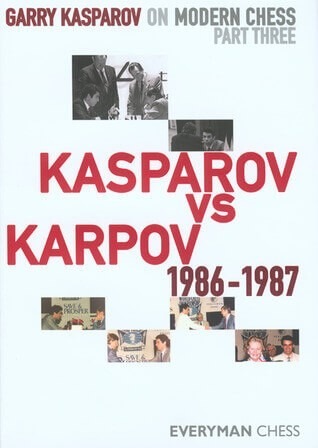 In this volume Garry Kasparov (world champion between 1985 and 2000 and generally regarded as the greatest player ever) analyses in depth the games from these legendary matches, giving his opinion on the background to the matches as well as the games themselves.